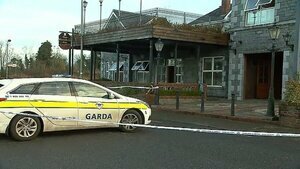 Yet another attack on a hotel that was earmarked as a direct provision centre should make us all apprehensive of what is to come. Indignation at successive governments mixed with a nativist ideology that sees any supranational interference in the running of the country as an affront to a particular vision of how the country’s government should function is a toxic mix that gives us these attacks. It also gives us the rise of the Far Right here and the popularity of its representatives. Throw in the fact that these same people believe that a white genocide of the Irish people is being slowly carried out by the immigration of refugees from the Middle East and you have a pre-political body that is on the cusp of evolving into a fully formed political movement. The parallels from history are obvious and do not bear repeating here. Given our own national history of emigration it is particularly galling to read comments saying that we are unable or should be unwilling to take in refugees. One of the common arguments against accepting refugees is that they are not “real” refugees, and are instead economic migrants. As if the millions of Irish people who emigrated over the centuries did not do so for economic reasons. Even if every person who applied for asylum seeker or refugee status here was an economic migrant, that does not preclude them from having suffered in their countries of origin. Besides, using the term economic migrant is a sterilising term; similar to the kind all too commonly used in economic arguments. It obfuscates the fact of the matter that real people migrate in order to feed themselves and their very real families. That does not make someone less deserving of being welcomed into our country. Again, the parallels with history are obvious, most especially our own history. But still we find those who want to say no and turn these people away. Some of the reasons used are the economic, and poorly understood, ones just mentioned. Others are more vehement in their insistence that Ireland should not take in any asylum seekers or refugees. For them, it is the human face of the conspiracy to Islamise and de-Aryanise the country. People like this cannot be reasoned with. But there are those who see answers and solutions offered by the Right and Far Right where previously they saw none and whose views are not so fundamentalist in nature. For these people, governments over the last ten years, along with the mainstream Left in the form of the Labour Party, have failed them. Politics, something they perhaps once thought to be carried out in a reasonable way by reasonable people, has become laden with those seeking to accrue more power in their personal fiefdoms. Their removal from the concerns of everyday life has created a gulf between them and those in whose name they are supposed to govern. The Right offers people a way to bridge the gulf between politics and daily existence whilst at the same time promising to get rid of those in power whose ideas and policies ensured the despoliation of a large portion of society. For those who see the Far Right as offering a salve, their rejection of the idea of allowing asylum seekers and refugees a place of sanctuary is almost an afterthought. It is not something that forms a fundamental core of their existence. It is not a centre around which a larger ideology exists. Instead, their rejection is based on the larger rejection of government policies. The government shows no concern for them so why should they be forced – forced in their eyes at least – to show concern for others who are not Irish. But there is a commonality between them and those seeking asylum and refuge here. Both have been let down by their respective governments to varying degrees. And both are currently victims of the policies of the Irish government. That this is not at least one element of tackling the Right and Far Right is short-sighted. A common understanding and experience of state repression, be it economic, military, political, or social, can be a force for binding together communities which up until then have not had much or even any experience of each other. Instead we are watching as the Right makes inroads in wider Irish society. Their successes are being made on the back of our government showing its disdain for people day on day. With its inaction on climate change, housing, homelessness, and economic justice, the government pushes groups of people further to the margins. We have government ministers saying that they will not pursue companies for committing fraud because they “don’t want to make employers the bad guy”. 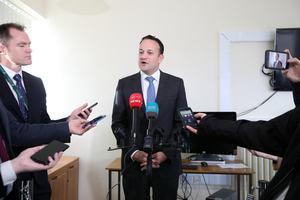 Nurses exercising their democratic right in choosing to strike for better pay and conditions are lambasted by the Taoiseach. And in a further betrayal of their base, SIPTU (Services Industrial Professional and Technical Union), who are aligned to the Labour Party, have said they will not support the strike. 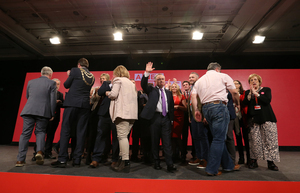 Their Health Division Organiser, Paul Bell – himself a Labour Councillor – said the strike, by not adhering to the government’s Public Service Agreement in which increases in salaries were agreed to in small increments, will not “deliver what we want to over the short to medium term”. Hence, the position held by Bell and SIPTU that workers should adhere to the government line regardless of the cost, be it democratic or economic. Even in their own self-inflicted implosion, Labour cannot but support the line that workers should work until their bosses say so and be grateful for whatever crumbs are thrown their way. Leo Varadkar’s thinking is more understandable in that he has an actual ideology to which he clings. 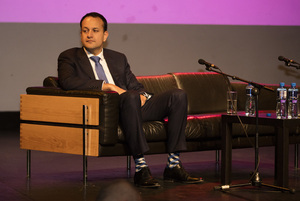 Labour seek power for power’s sake but the Taoiseach actually has values beyond the shallow pursuit of power. They may be the values of the free market where workers and unproductive citizens are expendable according to the dictates of companies and economic necessity, but they are values nonetheless. In this sense then, it is not that the concept that strikes should be inconvenient for governments escapes Leo Varadkar. He is simply insisting that unions should make things more convenient for him and his government as per market logic. With this in mind, and these are only very recent examples, is it any surprise that parts of the population have fallen into a reactionary stance? How that feeling is channeled is dependent upon who takes up their concerns and grievances, tells them they are not alone, and that something can be done. The mainstream Left has failed, thereby allowing the Right and Far Right take advantage of the political vacuum. Perhaps the people who have firebombed the hotels that were destined to house asylum seekers and refugees were motivated by racial hatred. Or perhaps they were motivated by a feeling of betrayal by the economic and political system. A system which tells them there is one law for the average person and another for employers and corporations. That tells them violent evictions carried out by a mercenary force backed by the national police force is perfectly acceptable but a counter-eviction of that same group of mercenaries is almost terrorist in nature. And a system that tells them to play by the rules that we have set at your expense or the crumbs you currently get will be reduced to nothing more than dust. In such an environment a reaction of some kind is guaranteed. How can it be otherwise? Ensuring that the reaction in question is motived by a sense of justice and not a feeling of hatred is incumbent upon us all. To gift the Far Right this opportunity is to repeat the monumental mistakes that have been made elsewhere in the world, especially in Europe. The effects of their institutionalised hatred are blatant. Governments, leaders, and corporations must be held to account, yes. But to do so at the expense of equality and justice is simply recreating the current system with a different facade where people are still expendable and some matter more than others. Bryan Wall: Labouring On Bryan Wall: Propaganda Bryan Wall: Right To The Extreme Bryan Wall: A Way Forward Or A Step Back? Posted in Misc and tagged Bryan On Monday, Bryan Wall at 2:13 pm on January 14, 2019 by Bryan Wall. Are you sure that sentence is long enough – could you not add a few extra clauses for the gas? 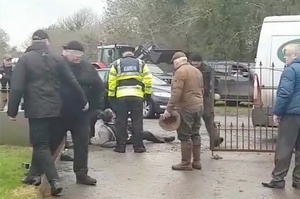 It’s only a few weeks since Bryan wrote succesive articles defending the vigilante mob that burned out and savagly beat the security team at the Roscommon eviction. Naked unashamed axe grinding hypocrisy. The underdog was the common theme. Hope that helps. Oh, won’t somebody think of the poor banks! For the love of god think of the poor banks…. Rob. leave politicians out of this. How about thinking about the fools that naively keep paying their mortgages since they’re the ones end up paying for those that don’t? Bryan, you’re wasting electricity and internet stuff. 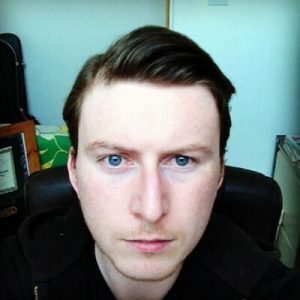 Broadsheet, any chance of an auto scroll to END for Bryan, Dan and a few others? The difference between the left and the right is immigration. The right blame it for everything bar the bad weather and the left never mention it at all. The truth is of course somewhere in the middle. The right see it as dissolution of the national culture and there is some truth to that because people do object to being overrun with those who do not even speak English. The left just shout racism at this but there is a ratio before a community flips into something else, and that is largely in poorer areas. And the most obvious being housing. There are plenty of other reasons; especially government’s neo liberal unwillingness to build more, but common sense should tell you that if you add 10% to the population then you need 10% more housing to maintain the same standard, likewise schools. It is not disrespectful to our new arrivals to ask how and where they are going to be accommodated and especially, how they are going to be integrated because if they are not, the exact same social issues will arise as elsewhere, including the emergence of the far right. If Ireland is not to follow other countries then this is a conversation that needs to be had. your tax contributions would not support such a proposal, I strongly suspect your virtue signalling generosity is with other taxpayers cash. Really? A liar who submits false affadavits about her fake dead daughter? I am all for a fairly liberal immigration programme, but she was a con-artist. The focus needs to come off the refugees and asylum seekers. Legal, illegal or trafficked, they are incredibly vulnerable, especially the children, and need our protection. We can all get behind this. If you object to EU migration policy or against Direct Provision (or the location of its centres) that fight needs to be taken up with Brussels/Leinster House. Hear hear Bodger and Bryan. The fault is with the people in power not the people who have no power. Kindness to the vulnerable best shows up the lack of empathy of the government, its spin doctors and their quislings. Meanness is not a good foundation for any new society. Change, it is coming, let’s make it good. The problem is, if those guys had not done what they done, would we have even heard of the Roscommon / Letrim thing? Ohh, think of the children. That will get at the emotions. Perhaps try reading about the number of migrant children who have gone missing in this country – it might dent your cynicism somewhat. It’s a small step for these arsonists to start setting fire to a DP centre with people in it, or the houses of anyone they disagree with or that they think is causing [white genocide, eviction, homelessness, water charges, taxation, insert-gripe-here] while those people and their families are asleep in bed. It’s not Far Right, it’s FAR RIGHT….and they are everywhere but we can’t see them. They surround your bed at night in brown robes and chant hate-speech.